The Uphill Battle For Habeas Corpus in George W. Bush’s Washington, D.C.
As Republicans and Democrats voted to approve the Military Commission Act last week, those who love the law were mortified by its passage and angry at those who capitulated, but unwilling to give up. It was a rough week in Washington for the law last week. As president of the Center for Constitutional Rights, I spent much of the week fighting against the passage of the Military Commission Act, which stripped the fundamental right of habeas corpus from noncitizens. Because so much of the debate was focused on prisoners held at Guantánamo, the new bill’s full impact was poorly understood. But our loss in Congress last week has consequences for citizens, as well as for legal permanent residents (green card holders) and noncitizens anywhere–and consequences for the rule of law in this country. Habeas corpus, which has its origins in the Magna Carta of 1215, is the “Great Writ” protecting people from arbitrary detention, disappearance and indefinite detention without charges. The cornerstone of Western justice, it is essential to the idea that laws–not individuals, be they kings or Presidents–govern a land. The Center for Constitutional Rights, along with lawyers of all political backgrounds from some of the country’s largest law firms, has filed habeas corpus petitions for nearly 500 detainees at Guantánamo–none of whom have yet had their day in court. 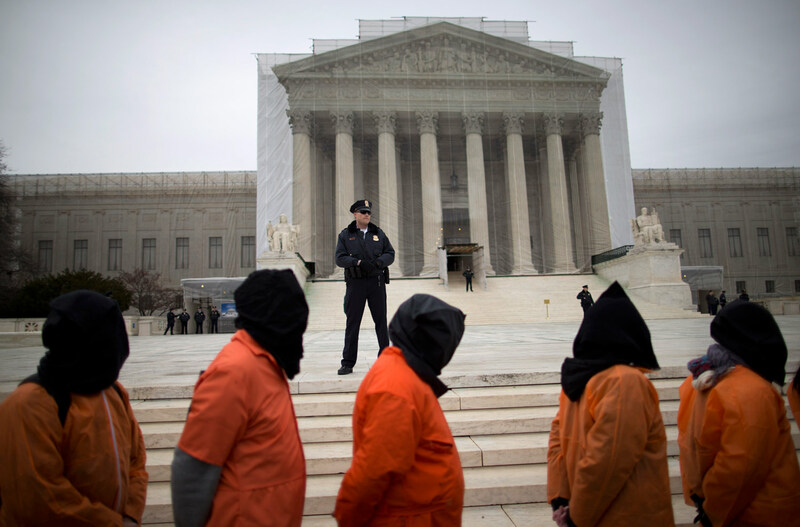 Twice in the past five years the Supreme Court has insisted that habeas corpus applies to these prisoners and ruled that the Bush Administration must apply the law. Yet last week Congress buckled in the face of election-year rhetoric about “terrorism” from the White House and passed new legislation denying our clients the right to challenge their detentions, or even to see the evidence against them. While I’m convinced that this law will not stand in court, we are still facing at least a year of challenges before it is declared unconstitutional. But it is not only our clients who are in jeopardy under this new legislation. Americans need to remember the sweeps and mass detentions after September 11, 2001, when thousands of noncitizens were rounded up and treated as terrorists–which none of them turned out to be. Habeas corpus was their remedy; they could go to court and force the Administration to justify their detentions. Now noncitizens can be rounded up, detained forever and never get their case into a court. And yet, even more sadly, the tossing aside of habeas corpus was only one of the draconian features of the Military Commission Act. Another nasty piece of the legislation authorizes the President, on his own authority, to detain anyone, citizen or noncitizen, anywhere in the world, whom he deems to be an “unlawful enemy combatant.” The definition of that term is broadly worded and would allow the President to imprison almost anyone. If you are unlucky enough to be a noncitizen and the President detains you as an unlawful enemy combatant, you can never test the legality of your detention in court because habeas corpus has been abolished. You are there forever… or until the President changes his mind. If you are lucky enough to be a citizen, your habeas rights will not get you out quickly: The President can now detain any citizen he chooses, without charges, simply by declaring that the prisoner is an enemy combatant. Moreover, the President is now free to abuse and even torture those detained, using the slippery language of this legislation. Many of the gross abuses we saw at Abu Ghraib and Guantánamo–stripping, hooding, hypothermia, sleep deprivation and possibly mock drowning–will be allowed to continue if the President says so. And those who authorize or carry out torture techniques will have complete immunity from criminal prosecution. Those who authorized the torture of detainees in the past will be granted retroactive immunity. When this was tried in Argentina and Chile during their “dirty wars,” it was called an amnesty, and, in the end, did not work. War crimes cannot be amnestied. Now we get to the final chapter of this awful legislation, which is concerned with the details of trials for alleged terrorists by a special ad hoc court called a military commission. Of course, such trials will occur, if they do at all, only for a very few of the 460 detained at Guantánamo or the many others detained around the world. As detainees can now be held forever without trial, why try them? To date, only ten of the Guantánamo detainees have been charged before such commissions. The Administration has been attempting to use military commissions for five years and has not yet been able to set up one that complies with the laws of war or the Constitution. Bush’s most recent effort was struck down by the Supreme Court in June. This legislation is no better: Coerced evidence is still permitted; a detainee does not get to see all the evidence against him, and a wide variety of hearsay evidence can be used. The President has wanted such sweeping authority since 9/11. He has been getting it piece by piece. First, with the Authorization to Use Military Force, he obtained from Congress the right to go after those involved with 9/11. Then he issued an “ executive order” in November 2001 granting him the authority to detain indefinitely without charges any noncitizen allegedly involved in terrorism–not just those supposedly connected to 9/11. Subsequently, he claimed the power as commander in chief to detain anyone, citizen or not, allegedly involved in terrorism or who might be giving support to those who attack the United States. The Administration argued that those so detained could be held forever, never charged and, except for US citizens, denied habeas corpus. Now Congress has placed its imprimatur on these fantasies of executive omnipotence–what can only be called the legal structure of a police state. My experiences in Washington last week were eye-opening. We came very close to saving habeas corpus. Thousands of lawyers, deans of law schools, bar associations, human rights activists and judges made the Great Writ a major issue, buttonholing staff members and senators and convincing them that depriving anyone of the fundamental right to habeas corpus was unconstitutional. The vote on habeas was structured separately from other provisions of the bill, and going into the vote we thought we might win; we probably had every Democrat save one, and all we need was a handful of Republicans. But as I saw one of those Republicans, Senator Susan Collins of Maine, cast her vote to abolish habeas I knew we had lost (final vote: 51 to 48) and tears welled up in my eyes. I had just witnessed the unthinkable. The remainder of the legislation passed the Senate by a much greater margin, 65 to 34, with twelve Democrats backing the entire bill. I was shocked: It did not need to be this way. The Democrats could have filibustered the legislation; with only a few days left before recess, they could have succeeded. Despite their strong vocal arguments against this legislation, in the end the Democrats caved. It was not a moment to be proud of. However, all is not without hope. In the courts we have prevailed, beating back the Administration’s unlawful attempts time and again. And while we did not win in Congress, we did better than expected. There seems to have been more of a public outcry about this legislation than in the past, particularly over the stripping of habeas corpus. The Administration’s fear-mongering and electioneering may have prevailed in the short term, but a growing number of people are unwilling to accept the destruction of our democracy. I am mortified by the passage of this legislation and angry at those who capitulated, but unwilling to give up. All of us fighting these battles are committed to the long, hard struggle to regain justice. Michael RatnerTwitterMichael Ratner is president emeritus of the Center for Constitutional Rights.